You'll find everything you need to become an Excel Master, here on the Contextures website. Whether you like to learn by reading, watching or doing, we've got something for you -- Excel tips, step-by-step lessons, sample files and videos. Start with the most popular lessons, listed below, or go to the full index on the Excel Tips page. -- Debra Dalgleish, Contextures Inc.
Start with these popular lessons, to learn new Excel skills. There are also 200+ free Excel workbooks that you can download. See how the formulas work, and get sample macros for your own workbooks. Instead of struggling to build workbooks or macros on your own, save time with our "Done For You" Excel products. 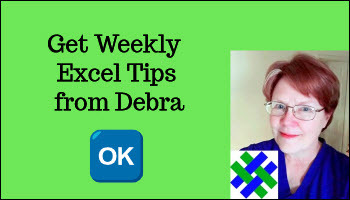 To help you learn more about Excel, I make step-by-step videos too. For example, these videos how the basics for creating drop down lists on a worksheet, with Data Validation. Click to start the playlist, or click the "Playlist" icon (top left), and click on a video name to start that video.